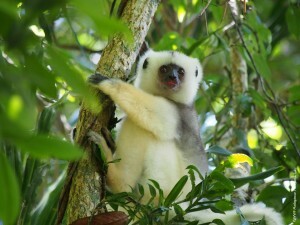 WWF Madagascar has been paving the way for lemur conservation in Madagascar for over half a century. 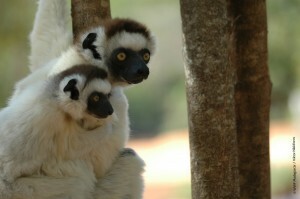 WWF Madagascar has been at the forefront of lemur conservation in Madagascar for over fifty years. Their first ever project involved setting up a small reserve dedicated to the protection and prosperity of the Aye-aye, leading to the creation of the Nosy Mangabe special reserve. Since then, lemurs have remained some the organization’s priority species at their project sites across the island. What lemur species does WWF Madagascar protect? Over the years, WWF Madagascar has been key to the protection of many different lemur species. 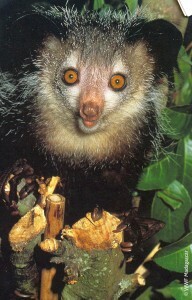 Nowadays – and alongside ongoing projects to protect numerous lemur species – WWF’s strategy (Fiscal years 2012 to 2016) identifies the Silky simpona (Propithecus candidus) as one of their flagship species for the Northern Forest Landscape, the largest remaining stand of humid forest in Madagascar. In 2011, WWF – in collaboration with Dr. Erik Patel (now at the Duke Lemur Center), and international expert on the Silky simpona – conducted a vulnerability analysis on this species; the first of its kind. This groundbreaking research – which helps conservationists understand more about the different threats facing a species – was expanded in 2012 in collaboration with the IUCN (International Union for Conservation of Nature) and again in 2014 with the help of GERP. This research now helps scientists and organizations better plan their conservation programs. WWF Madagascar is currently performing fieldwork to collect vulnerability data and information on species viability. This project began in December 2014 and will be followed by updates of the Vulnerability Analysis (VA) until the end of 2017. The aim is to understand the factors that render the Silky simpona vulnerable in order to start implementing adapted management measures that will help the species to face future climate and non-climate pressures. How is WWF Madagascar protecting habitat for lemur conservation? WWF has been, and continues to be involved in, the establishment and management of many protected areas across Madagascar, which serve to conserve and protect threatened habitats for many lemur species as well as a wide variety of other flora and fauna. In addition, WWF Madagascar carries out a range of actions in Madagascar aimed at protecting habitat. For example, in the Northern Forest Landscape, WWF trains and equips local communities to perform forest patrols. One of the functions of the patrols is to collect information on species locations and populations. Both the presence of the patrols and the data they collect are being used to combat poaching of lemurs and other animal species. WWF are currently working on habitat protection issues across Madagascar in many sites, including: Marojejy, Kirindy Mitea, Tsimanampesotoe, Amoron’i Onilahy, Ankodida, Corridor Marojejy Tsaratanana, Anjanaharibe Sud, Nord Ifotaka, and Ranobe PK 32. WWF Madagascar, and WWF as a whole, are able to raise awareness of the threats facing lemurs at the national and international level. An example of the positive impacts of their work include WWF’s debt-for-nature concept, which pioneered the idea that a nation’s debt could be bought in exchange for in-country conservation programming. 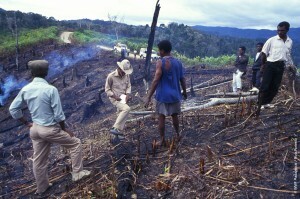 WWF has used this program to generate over $50 million (USD) of funding in Madagascar for conservation from 1989 to 2008. In addition, WWF Madagascar was a key facilitator in the First International Conference on the Conservation of Nature and Natural Resources in Madagascar; this meeting was the foundation of the National Environmental Action Plan that was later implemented in Madagascar in the 1980s. WWF puts local communities at the center of their conservation projects. Local communities that live closest to valuable, fragile lemur habitats are pivotal to the success of lemur conservation because they are the ones interacting with, living in and depending on the forests and species on a daily basis. WWF Madagascar’s team working in Andapa. WWF manages a wide array of social development programming; in the past, the organization has developing eco-tourism projects, designed public health programs, and even worked with the Malagasy government to create eco-labels for Malagasy shrimp which are traded on the international market through the shrimp aquaculture industry. In the Northern Forest Landscape, a green belt composed of 39 community-based managed areas is currently being established around the newly created protected area of COMATSA (245,000 ha). Each area managed by local communities first undergoes a zoning process and then local management plans are developed. As the Silky simpona is a flagship species for the entire area, activities related to its conservation and resilience building will be developed for the protected areas as well as for all the community-managed areas where the species is present. Since 1987, WWF Madagascar has been growing its environmental education program, in collaboration with the Malagasy Ministry of Education. The program now has 515 student clubs across 46 districts in Madagascar and impacts over 50,000 students in the country. In addition, the program also prints the Vintsy Magazine – an environmentally focused publication – which has been in print for 64 issues. Donations cannot be made directly to WWF Madagascar. All donations help further WWF's worldwide efforts.